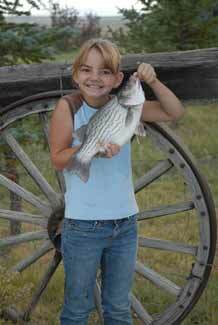 Fish Elko......you will be AMAZED! 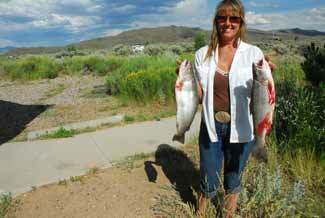 Each year anglers make the trip to the blue ribbon waters of other states. They pass right by outstanding fishing opportunities on their way to places so crowded that you should bring your own rock to stand on.....not so with Nevada fishing. 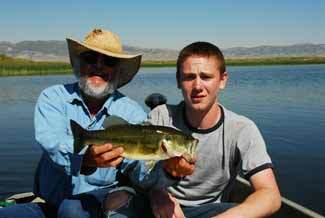 Quality, diversity, and low angler pressure describe Nevada fishing. Hundreds of fishable streams, beaver ponds, and reservoirs (both public and private) hold a mix of rainbow, brown, brook, and cutthroat trout. Bass largemouth, smallmouth, and the hybrid "wiper" (striper x white bass) as well as yellow perch and channel catfish can make for an interesting mix. Our ranch is one mile from South Fork Reservoir, a mid sized reservoir that has gained region wide attention for its trophy sized smallmouth bass averaging 3-4 pounds, and abundant rainbow trout averaging 2-4 pounds and 18"-23". The spectacular Ruby Mountains are the backdrop. The Ruby Marsh is made up of 26,000 acres of ponds, channels, and islands with an abundance of largemouth bass and trout. The Ruby Mountains tower to 11,000 feet on the west side of the marsh. You will wind your way through a maze of tules and hidden channels where bass wait to pounce on your lures or flies. 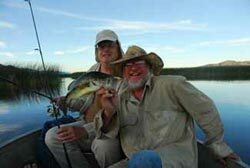 One hundred fish days are the rule.....not the exception, and the bass are wonderful on the table. 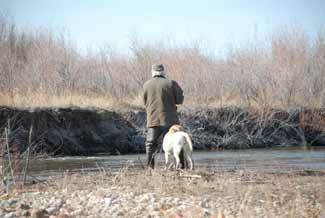 Many of our clients have returned to Ruby Marsh again and again because it is so special. We maintain a three bedroom cabin at the Ruby Marsh available for our guided and unguided clients. In addition, canoes and aluminum boats are available. 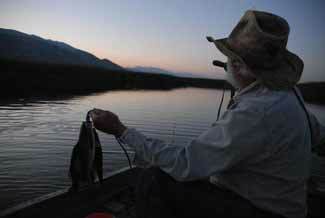 June through September is prime fishing time. Some folks have spent nights on the marsh because they could not find their way out of the maze. We have been guiding for over 30 years.....come experience fishing for huge rainbows and the states most explosive largemouth bass at Ruby Marsh with professionals! With over 35 years experience we don't just tell you about it.....we take you right to it and show you how it is done! 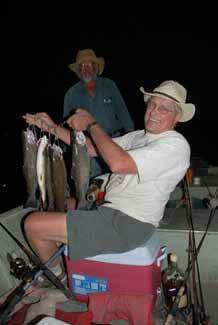 We provide meals, lodging, boat, bait, and knowledgeable guides who have been there before. Loaner rods, reels, and necessary equipment is also available if needed. 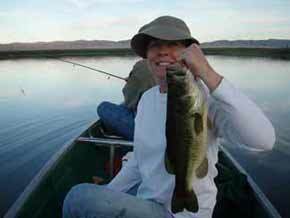 Spinning rods, fly rods, bait, flies, or lures, whatever your tackle preference! We can customize a trip to suit your interests. Even novice anglers catch fish with us. Like jewels scattered among the sagebrush covered hills and flowing from the snow capped Ruby Mountains, great fishing destinations await your discovery. It all starts with a phone call to discuss open dates and your interest.